Auckland Transport are crowing about the latest results of their customer satisfaction survey for public transport, and understandable so. For the first time the survey shows satisfaction with PT at over 90% and this has risen significantly over the last year or so. Aucklanders are loving the on-going improvements to public transport. The latest customer satisfaction survey done for Auckland Transport for the year to September 2017 shows overall satisfaction across bus, trains and ferries has risen to 91%. Those levels compare well to Wellington at 92% and Sydney at 89% (Nov 2016). Brendon Main, Group Manager AT Metro Operations says satisfaction levels have been rising year on year as AT has introduced more services that are more punctual and reliable. 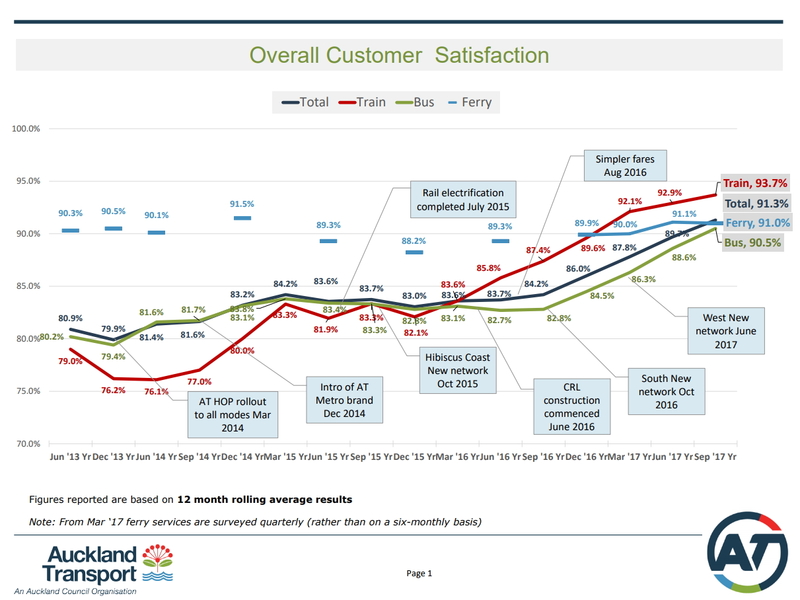 Customer satisfaction for rail services has jumped the most from 79.0% in June 2013 to 93.7% now. 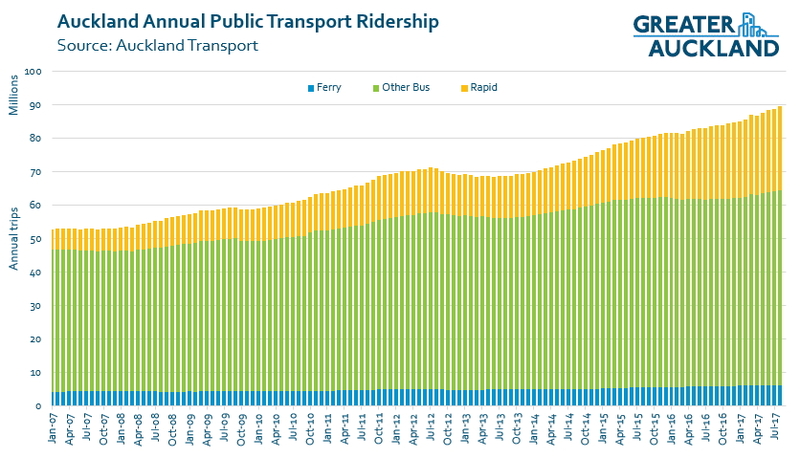 Over the same period satisfaction with bus services has leapt from 80.2% to 90.5%. Auckland Council Planning Committee chair Councillor Chris Darby says is also pleased with the improved performance. “I use the ferry daily and I’m happy to see the satisfaction level is sitting at 91% overall. “We’re in the midst of a public transport revolution, with record levels of patronage. Aucklanders have a growing appetite for bus, ferry and rail travel, and making this reliable and easy to use is a key priority. Overall public transport boardings totalled 89.4 million boardings for the 12 months to August 2017, an increase of 7.1%, or 6.0 million boardings in a year. The number of passengers using the AT HOP card has risen from 89 to 92%. Again, this is world-class in terms of uptake. The Auckland Transport Customer Satisfaction Survey was conducted by Gravitas Research, in the 12 months to September 2017 there were 10,796 surveys done. This is a good sign from AT and of course, there is no greater confirmation of this improvement in customer experience than the ridership figures which have been rising strongly. Important. Unlike patronage this is actually a worthwhile measure (patronage growth is like crowing because your ministry got extra funding) as it measures the quality of the service/pseudo outcome measure. Patronage growth shows you are providing a service that actually works for people. Bums on seats is the best measure of effectiveness. Not sure if the difference between 85% and 95% satisfaction is material to be honest. At least not as material as a ten percent increase in the number of people actually using the service. …there is no better measure of the quality of the service than the number of people who chose to use it. Another thing to consider is how @&*^! other modes currently are. If driving is severely congested and painful then an average PT service may seem great. That’s an interesting point, however I suspect that the reality of that measure would be very nuanced. If you travel with the flow in the AM and PM peaks across the harbour bridge, your experience would be very different to counter-flow travel on the same route. That route of course would be very different to other possible start/destination routings. That said, I’d be curious to see some sample routings and the satisfaction levels with all modes across those routings. I’d say patronage is a more valuable measure as it is absolute. Satisfaction is a relative measure as those of us who used PT 10 years ago are quite happy with where it is now, but someone moving from Sydney would probably not be that impressed. Wrong. Bus patronage, like vehicle count, is not good/bad in itself. Is more people driving better? No. What matters is whether the mode is fast, safe, and efficient. If there are no good alternatives, then patronage may go up regardless of the quality of the service. So I’ve just given you my logic on why satisfaction is not an ideal measure, you’ve just given me your logic for why patronage might not be the ideal measure, which raises a fair point. Care to explain how you then get to the conclusion that I’m wrong and you are right? I think it’s important too. Even if just because if more people are prepared to say they are satisfied, that probably means more of them are talking positively to non-PT users and encouraging them to give it a try. People must have very low expectations if 93% are satisfied with transit in Auckland…. Why do you say that? Care to share your negative experiences? Yeah well everyone I know has just given up reporting things to AT (especially PT related), because they either take weeks or even months to respond, if they respond at all. Also the response is generally a repetitive template that does exactly zero to remedy the issue. Perhaps this is why their satisfaction figures are going up? Spot on. I made two separate complaints about a recurring issue in my neighbourhood and I have 2 identical copy/pasted responses from two different AT reps.
Could be people used to a poor Auckland service, but definitely seems an improvement since new network & getting the electric trains running more reliably etc. Could be only satisfied people that want to respond to the survey’s? (how are they conducted?) or the very dissatisfied ones have all gone back to driving and such. If you look at the big picture, there has been a lot of changes & improvements in a difficult political environment that AT have progressed through. I agree that it’s gotten better. I used to take trains over buses (wide shoulders, small seats) and if I had to go up Queen St I would have rather walked – Faster. For me, usually walking in town and taking a bus for the first time in a few years, it was a very pleasant surprise. Where are the survey questions? I’d love to know what questions were asked. Any questions asking for concerns? E.g., train dwell times? I don’t see a sample size or a margin of error.